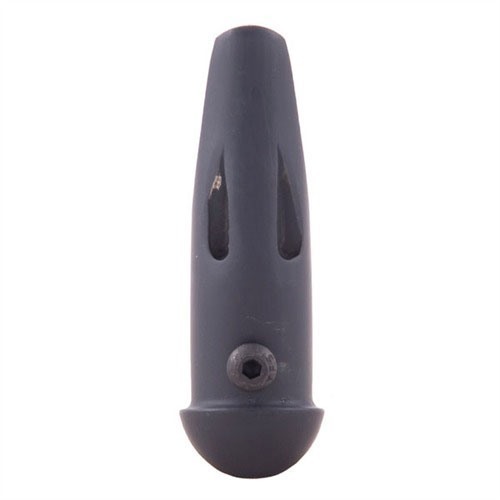 Brass plug fills recess at the rear of grip and provides additional weight to reduce recoil and improve balance. Helps prevent “limp-wrist” malfunctions, especially in weak-hand shooting. Mag chute aids fast, sure reloads. SPECS: Brass, matte black finish. 2.4” (64mm) long. 3.5 oz. (99g) weight. 17 fits 17/20/21/22/34/35/37, 19 fits 19/23. May require minor fitting, but no modifications to gun. Messing plug fyller sporet på baksiden av grep og gir ekstra vekt for å redusere rekyl og bedre balanse. Forebygger "limp-håndledd" feil, spesielt i svak hånd skyting. Mag chute hjelpemidler rask, sikker laster. Spesifikasjoner: messing, Matt svart finish. 2,4"(64mm) lang 3,5 oz. (99g) vekt. 17 passer 17/20/21/22/34/35/37, 19 passer 19/23. Krever mindre passende, men ingen endringer pistol. I've been using the Seattle Slug on my G17 for almost a year and the gun feels more balanced, and the added weight reduces felt recoil. It also provides a partial ramp to help sure up reloads. I was going to add a full magwell, but they are a little bulky for CCW and shorten the usable length of the grip, which doesn't work with my large hands. This is not a problem with the Seattle Slug. The black finish holds up fairly well - it's wearing on the bottom edge from shooting prone on concrete, which is to be expected, but with a little sight black or marker it touches up fine. One thing to watch for is my Glock frame developed a hairline crack right at the lanyard hole where the screw secures the slug to the frame. It was probably my fault for screwing it in too tight, and was easily fixed with a little Gorilla glue before it got worse. Just something to watch for. Overall, the slug is easy to take on and off which I do frequently between duty use (on) and IPSC (off). I would definitely recommend. Prompt shipping is the only reason for 2 stars instead of 1. Ordered slug for Gen4 17. Received in more than satisfactory time. Followed the included instructions for proper fitting/installation with poor results. Went to website to see if I missed something in original instructions. First thing I notice on website is an advertisement for their prototype for the Gen4 glocks with a picture of a customer's slug he had attempted to fit in Gen4 saying "don't do this." Went back to Brownell's site to see if I had missed anything in the original description. I did not. There is no mention that this item will NOT fit a Gen4. I also reread original instructions. No mention of NOT fitting Gen4. A little disappointed in this oversite of both parties. I am sure this would work great if it fit. 19 Seattle Slug-Gen 3 Glocks Messing plug fyller sporet på baksiden av grep og gir ekstra vekt for å redusere rekyl og bedre balanse. Forebygger "limp-håndledd" feil, spesielt i svak hånd skyting. Mag chute hjelpemidler rask, sikker laster. 17 Seattle Slug-Gen 3 Glocks Messing plug fyller sporet på baksiden av grep og gir ekstra vekt for å redusere rekyl og bedre balanse. Forebygger "limp-håndledd" feil, spesielt i svak hånd skyting. Mag chute hjelpemidler rask, sikker laster.